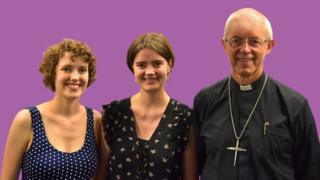 The Church needs to do more to embrace disability and mental health, the Archbishop of Canterbury Justin Welby says, drawing on the experience of two of his daughters. Justin - he insists we use his first name - reveals that Katharine's mental health difficulties and Ellie's learning disabilities, had "really brought it to the front of [his] mind". He was speaking to the BBC Ouch podcast, made by the BBC's disability team. Sitting beside his daughters, Ellie, 24, and Katharine, 32, Justin encourages them to speak openly, even if what they say makes uncomfortable listening. He begins by taking Ellie's hand - this is the first time she has spoken publicly. 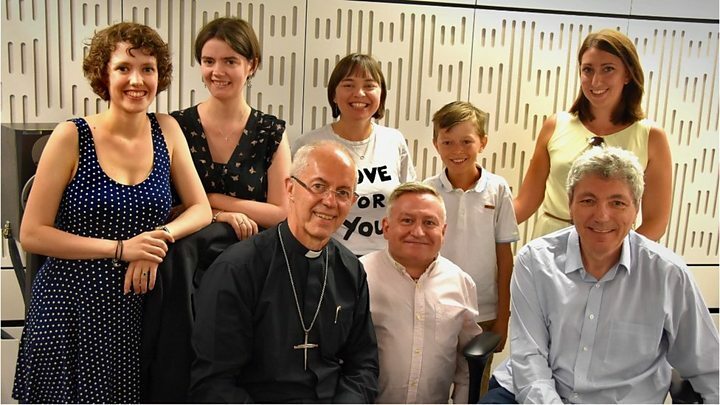 Taking part in a discussion about exclusion with other disabled studio guests, Ellie says: "The church I go to now, I sit at the back because I don't really feel comfortable. "They're very friendly in my church, but sometimes I can feel a bit out of place there." Ellie also has dyspraxia, which impacts co-ordination, but can be confused with clumsiness. "I have struggled a lot. People have looked at me and basically - I know the look now - it's literally like, 'You're not disabled, why are you sitting there?' Or, 'Why can't you do this?'. "I've been discriminated against quite a few times because they don't understand it." Justin gives Ellie - who confesses she is a "Daddy's girl" - a friendly punch on the shoulder to acknowledge that she's made a good point. He, himself, has struggled at times with what he calls "the black dog" - a phrase Winston Churchill used to describe episodes of depression. In 1983, the Welbys lost a seven-month-old baby, Johanna, in a car crash. Twelve months later another of his children was critically ill. It has often led him to question his faith. "There have been moments where it's been a huge test," he says. "You read the Bible and life's not simple." Does the Archbishop prefer listening to S Club 7 or the Backstreet Boys? Religion hasn't always been so important to him. At boarding school he used chapel time to finish homework, hidden behind the hymn books. The only interesting thing that ever happened, he says, was the "headmaster falling out of the pulpit". It was years later, when he worked in Kenya as an oil investor, that he met people with a great connection to God. It was the first step on the path to being ordained in 1989. Katharine has spoken openly about her mental health struggle, suicidal thoughts, and of not being able to confide in her parents about them. She says the Church does not always know how to respond to these struggles. She says people offer to pray for her, but feels this masks important conversations and opportunities to help. "If your first response is, 'Can I pray for your healing? ', then you're not listening," she says. "Because actually - A, you don't need to say to someone you're praying for their healing for God to be able to work, God's bigger than that. And B, it really shuts down the conversation. "I now actually only let a very few people pray for my healing, because I've had so many really awful experiences." The most hurtful thing, she says, was when someone prayed for her "addiction to negative thinking". "I'm not addicted to negative thinking, I'm depressed and anxious medically," she says. "It's a chemical thing going on with me, it's not an addiction. And that was really unhelpful. I felt very unsettled by that. "They're trying to be helpful, but they're not listening. And inclusion and welcome in Church is about so much more than accessibility physically." Many disabled people experience unwanted prayers, often in the street or on public transport. Even the Archbishop has been offered prayers. "I've had times when people have said, 'Could we pray for you?' And if I wasn't the Archbishop I'd have actually said, 'I'd really prefer that you didn't'. "But I feel that I can't always say that." But does he include his own children's disabilities in his prayers? He says he prays for Katharine and her mental health on a daily basis, but for Ellie it is more nuanced. "I haven't prayed for Ellie," he says. "I haven't talked to Ellie about this [but] we had this discussion once around the [family] table when Ellie wasn't there, because someone had asked me the question." Turning to Ellie, he says: "Your younger sister said, 'If God changed Ellie she wouldn't be Ellie, and we love Ellie'. So there's that thing that Ellie's Ellie, she's precious." He sees Katharine's mental illness as something she's not always had, but Ellie has always had the disability and it's part of her. Ellie, herself, is ambivalent about disability and prayer. "I have felt a bit like, well if God heals why am I still dyspraxic? Why do I still find it really difficult to do things? But at the same time it doesn't change the way I trust God." Justin reveals that he needs to compile a list of "awkward questions" to ask God "when I meet Him". And while he's at it, perhaps he might try to persuade God to watch the sitcom Mrs Brown's Boys, which the Archbishop says he watches and is a "good way of unwinding". Justin is conscious the Church needs to be aware of, and embrace, people's differences and needs. Katharine, who also has chronic fatigue syndrome, says she has felt embarrassed at times when she has been unable to stand during services. "You can feel quite uncomfortable, like people are looking at you, like you're not paying attention or not engaging properly." She says more flexibility and acceptance is needed. "If someone goes in and the first week they're there they get tutted at, then they're not going to come back." More parishes have started to use the phrase "stand if it's convenient", Justin says, because, when it comes down to it, "it doesn't matter tuppence" how someone worships. "You do have to go through a process of educating people," he says. "Get rid of the frowns and the tuts." Justin hopes to find more solutions to these problems when he hosts a conference in July at Lambeth Palace on disability and inclusion. One question he really wants to address is the physical accessibility of churches. Many of the Church of England's 9,000 buildings are ill-equipped and inaccessible, but heritage protection currently trumps accessibility law. "I find it absolutely extraordinary that disability access comes second to heritage," he says. "I really find that bizarre. Well, that's one way of saying we don't care about you, isn't it?" Ahead of the conference he has another important event - the christening of Prince Louis on 9 July, which he says is "very nerve wracking" but "a great privilege". "You know, if you're at the wedding don't drop the rings and if you're at the baptism don't drop the baby. They're a wonderful family, there's lots of love and it'll be a great occasion."